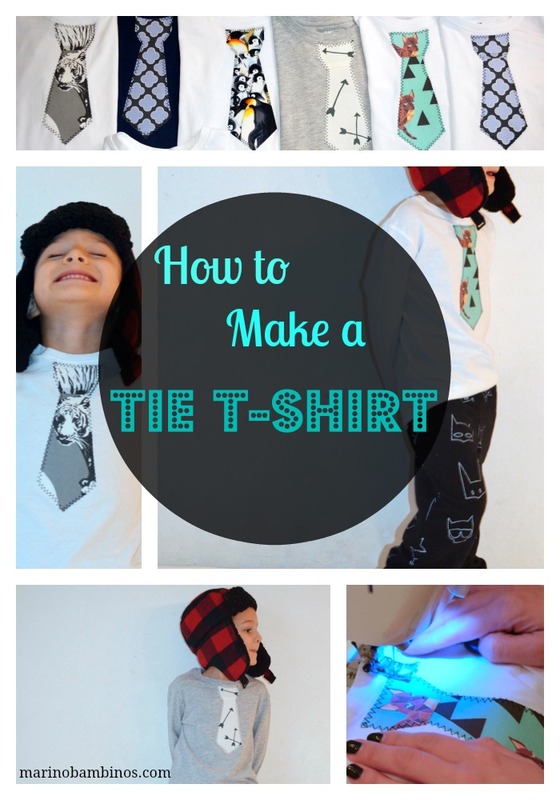 There is nothing quite like gifting homemade, and these simple DIY Tie T-shirts have continued to be a huge hit among recipients! Follow my below tutorial to whip-up a few for the special little guys in your life. Sewing machine optional! Draw a pattern: I like to use two different patterns. One for baby onsies and another for toddler sizes up. I believe that the trick to making the bigger sized tie is to create two separate patten pieces for a snazzy look. Select fun fabric: Great fabric is an absolute must. The above selections are from JoAnne Fabric, Spoonflower and Minted. Gather supplies: Necessary supplies include an iron, ironing board, rotary cutter or scissors, material, solid t-shirts or onesies, tie-patten and a package of Heat and Bond. If you choose to not use a sewing machine purchase the ultra hold Heat & Bond in the red package. If you stitch the border with a sewing machine like I do – you may want to go with a lighter-weight option. Apply Heat and Bond and Align Pattern On Fabric: Follow the instructions on the Heat & Bond packaging – ironing the Heat & Bond to the wrong side of your material. Flip it over and align your pattern pieces on the material. 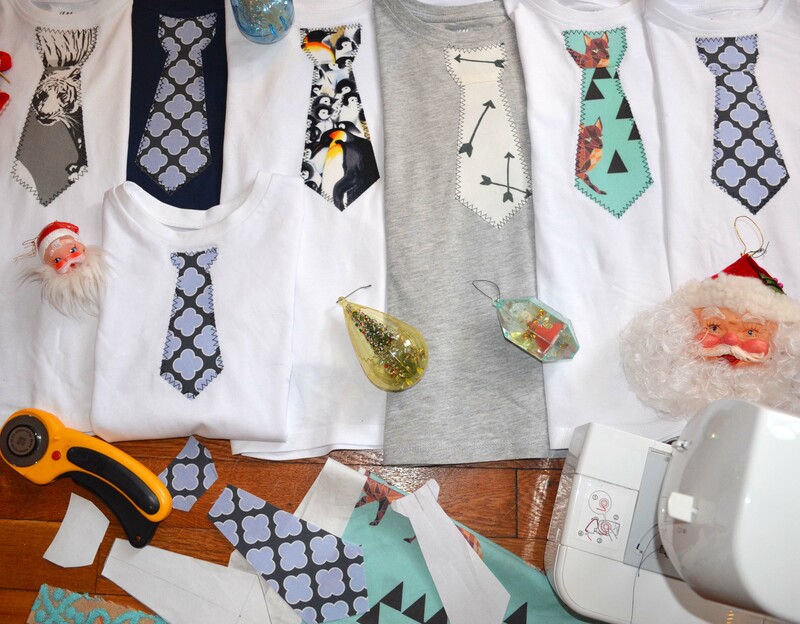 Cut out your pattern pieces: After carefully aligning your pattern pieces on the material, cut them out with a rotary cutter or scissors. Peel the back of the heat and bond off of the material. Align your tie pieces on the shirt: Carefully align your tie pieces on the shirt. I like to have the top piece slightly overlap the bottom tie piece. Iron your pieces to the shirt: Follow the instructions on the back of the Heat and Bond for iron settings. 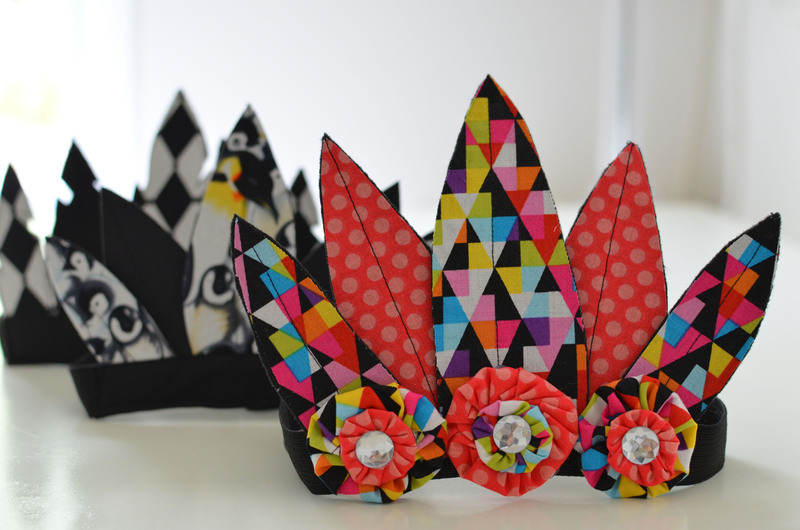 If you’re not sewing – than you are done! Sew around the borders: I like to use a wide zig-stitch in a contrasting thread color. In addition to creating some homemade goodness, it’s always thoughtful to gift essentials. I just put together a Christmas package for a dear friend who happens to be a newly minted mother-of-three boys (under three!). She’s often bemoaned the fact that diapers and wipes feel like a constant purchase so we’re also sending some of our favorites from Huggies to help get the kiddos through the Holiday Season. 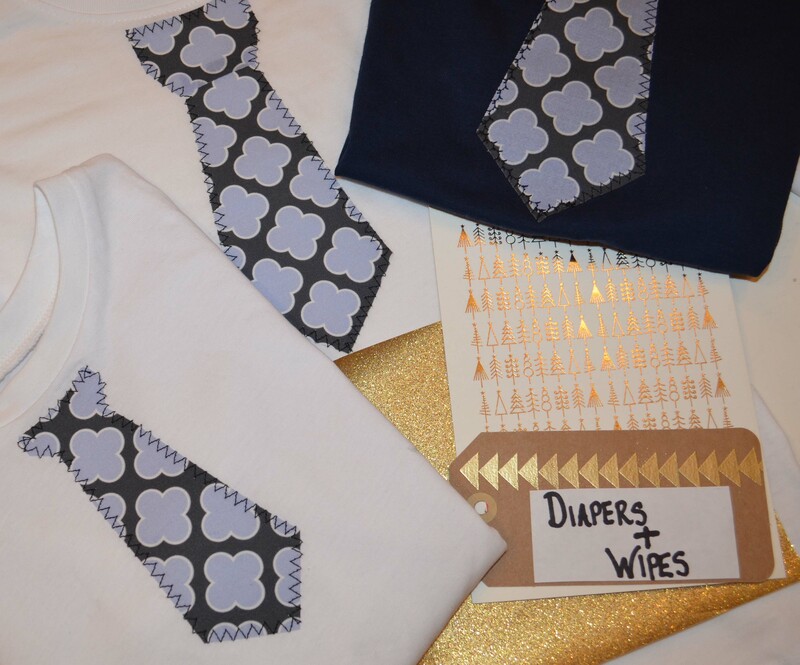 I tucked in a little “diapers and wipes” gift tag along with the trio of shirts to let her know that Huggies Natural Care Wipes and Little Snugglers Diapers will soon be on their way. Request a sample of Huggies Little Snugglers Diapers with a fantastic GentleAbsorb Liner – and Huggies fragrance free, alcohol-free and hypoallergenic, Natural Care Wipes. Also enter to win your dream registry via Huggies Little Snugglers Registry Relief. Cheers to a beautiful Holiday and making great things! We all want our kids to have a spirit of gratitude – during the Holidays and year-round. 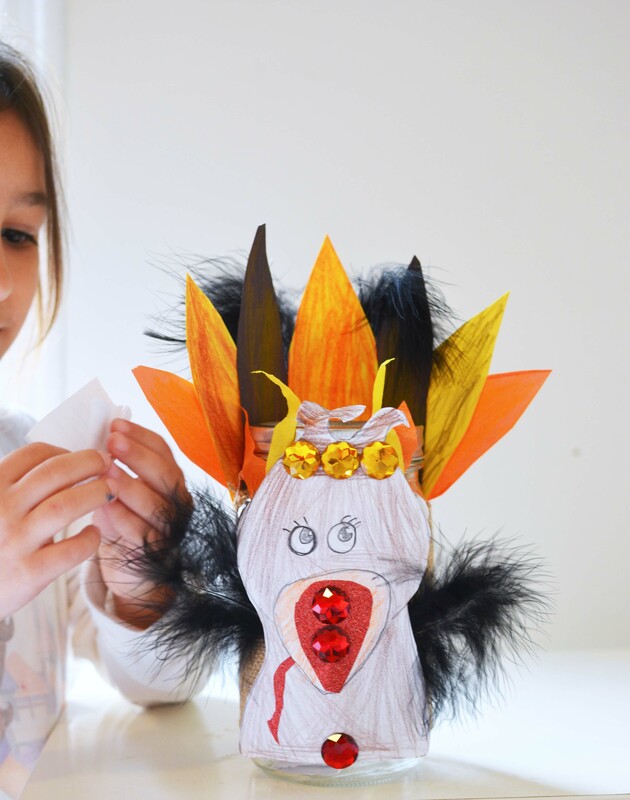 Fun family projects can help to facilitate discussions of thanks in tangible ways that make sense to kids. 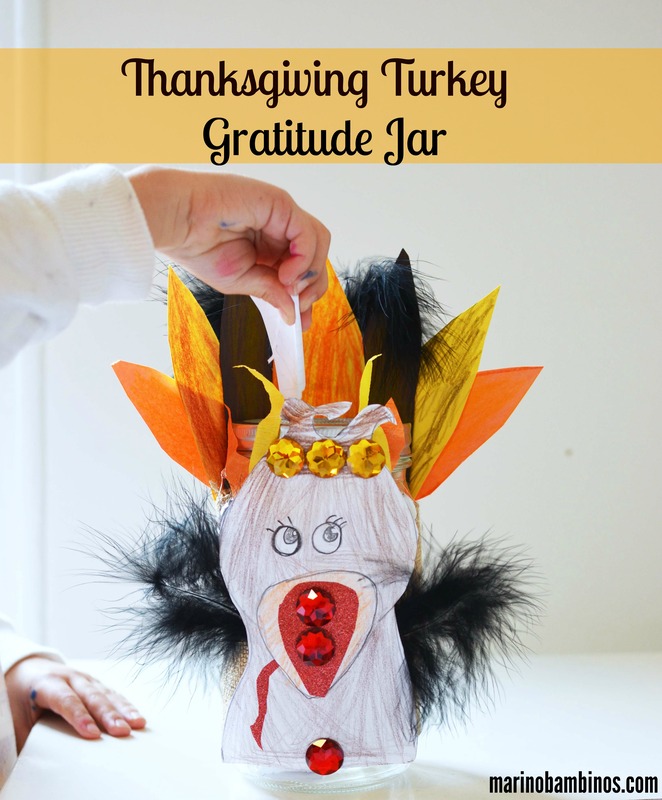 We recently created a DIY Thanksgiving Turkey Gratitude Jar and hope that it will help keep all that we are thankful for in our present thoughts! This super quick project is fun and simple! 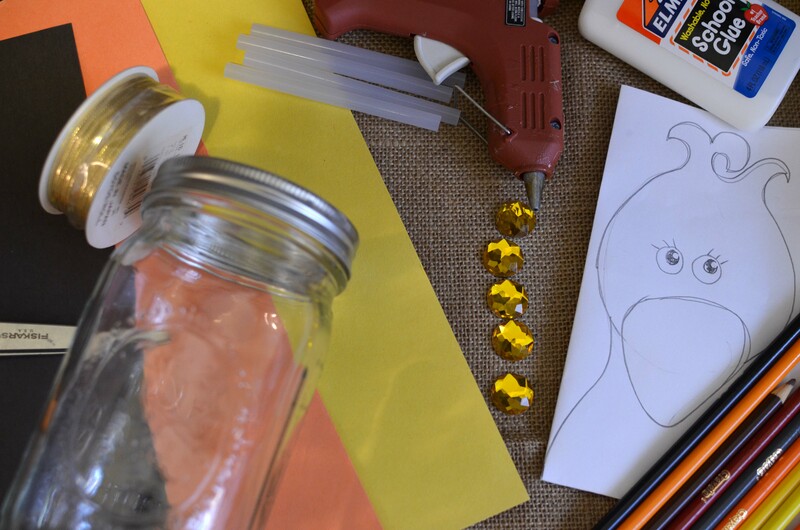 Just gather basic arts and craft supplies, a mason jar, a hot glue gun, a strip of burlap and other decorative items. First, glue a strip of burlap all the way around the mason jar. Next, draw a fun Turkey head on a piece of paper. 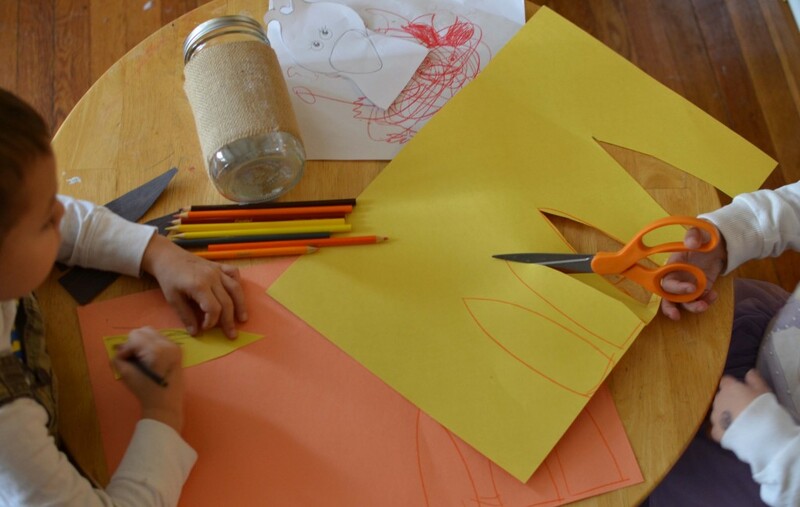 Draw a few leaf shapes on construction paper and have the kiddos cut them out, and color them however they see fit. Dress your Turkey up! Color your Turkey and have fun adding jewels, glittery duck tape or other decorative items. Glue your Turkey together! We glued faux feathers and construction paper feathers to the back of the mason jar with a hot glue gun. 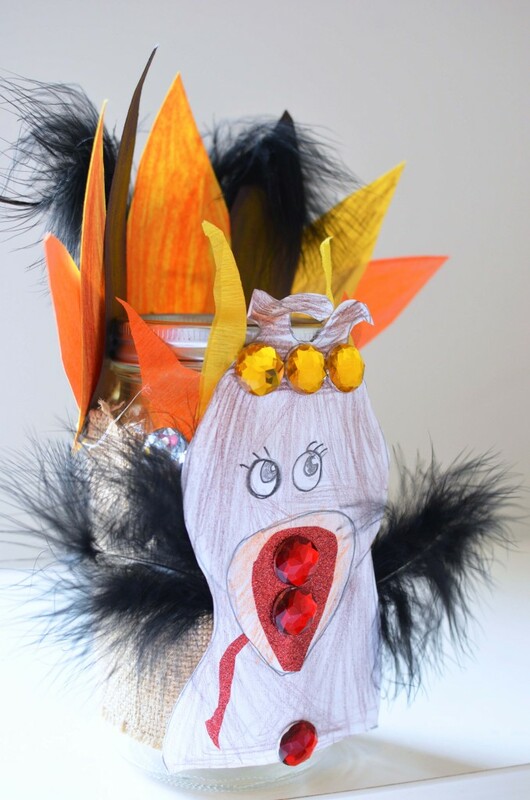 Streamers and faux feathers were also added to our Turkey’s head before securing her to the front of the jar with the glue gun. Celebrate the goodness of littles counting their blessings! I’m thankful for milk, and costumes, and mommy, and my sister, and twirling, and taping pictures above my bed. My gosh, how these little people remind us to live in the present – and for that I am truly grateful. So don’t forget to include your own daily notes of gratitude and enjoy watching the collective goodness trickle in. We have so much to be thankful for this holiday season including seeing the joy that a new baby brings to our extended family. With Holiday shopping on everyone’s mind, we’re excited to continue our partnership with Huggies. Diapers and wipes are a great gift for mamas of wee ones and Huggies newest products are better than ever. Huggies Natural Care Wipes are comprised of their simplest formula which is perfect for baby’s delicate skin and wiping big siblings hands. I like the fact that they are fragrance free, alcohol-free and hypollergenic which is gentle for baby yet hearty enough to clean true messes! Pair them with Huggies Little Snugglers Diapers for a thoughtful gift that will carry baby in comfort through those holiday car trips. Mamas can rest assured with a GentleAbsorb Liner that draws mess awa, and a unique stretchy Snug Fit Waistband for a comfortable, secure fit. Request a sample of Huggies Little Snugglers Diapers and Huggies Natural Care Wipes and don’t forget to enter to win your dream registry via Huggies Little Snugglers Registry Relief. Hoping your registry wish comes true this holiday season! It’s officially national sewing month! To celebrate, I’ve partnered with Jo-Ann Fabric and Craft stores to create a fun tutorial for their #sewyourstyle campaign. 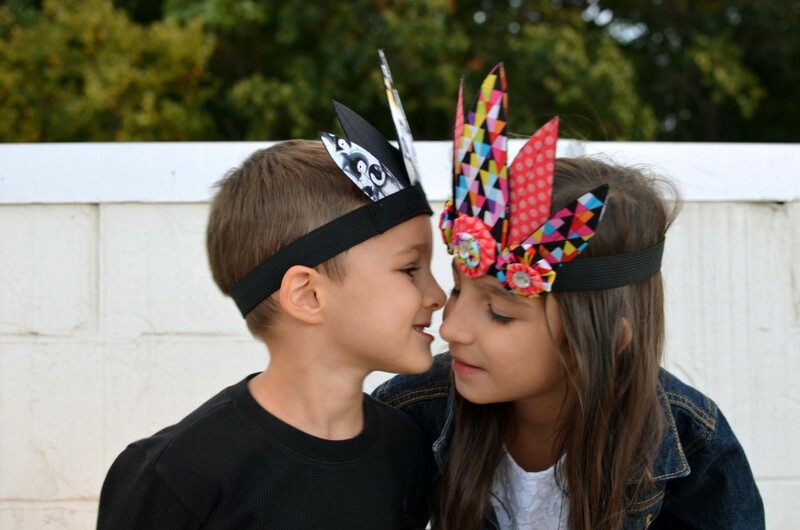 With a goal of utilizing quilting fabric in a non-traditional way – I made Fabric Feather Crowns for the dress-up-play-obsessed kiddos in my home. The process is fun and easy! Small pieces of assorted fabrics. I went for monochrome, animal print, and pattern mixing themes. Felt (the thick kind, not the flimsy kind). 1) Draw feather patterns and pair your materials. The slits can be cut in the end and don’t need to be included in the pattern as seen above. 2) Place the wrong side of feather fabric to the bumpy side of Pellon 805 Wonder-Under and press for about 5 to 10 seconds. 3) Use your pattern to cut out your feathers after fusing to Wonder-Under. 4) Peel the paper off of the back of the Wonder-Under and fuse your feathers to a piece of felt. Use a pressing cloth and press well for about 10 seconds. Again – remember to use thick felt to give your feathers the ability to stick up. After pressing cut the felt around the feathers. 5) Measure your kiddos head with elastic. 7) Arrange the feathers and sew them onto the elastic making sure that he elastic seam is in the front to conceal the stitching. 8) Top stitch down the middle of each feather (and around if desired). A decorative stitch would also look nice. 9) If desired, stitch a small piece of felt to the front interior of the headband for a clean look ( I only did this to one crown and found it unnecessary). 10) Embellish the bottom of the headband however you like to conceal the stitching. I made layered yo-yos with glue-gunned rhinestones for my daughter’s crown. For a gender neutral look, I made a strip of bias tape for the penguin crown, and stitched a piece of felt to the monochrome diamond crown. Join in the fun by creating something unexpected with quilt weight fabric and enter to win some amazing prizes in Jo-Ann’s Sew Your Style contest sponsored by Pellon. You have until September 30th to get your entries in for a chance to win a 1,000 cash prize, a Singer Heavy Duty Sewing Machine and more! Visit joann.com/sewyourstyle for more info and join the conversation with #sewyourstyle. Thank you Jo-Ann Fabric for sponsoring this fun post. Listening to the urge to create is always a positive thing. I’m happy that my sewing machine came out this week to make a sweet little dress for my best girl. I didn’t follow a pattern and structured the dress with ample room to stretch a few seasons. This one was a fairly simply sew with black knit fabric from my stash and glorious rainbow pom pom trim that I’ve been hoarding for quite some time. After forming the dress, I stitched elastic casing on top and decided to add thin elastic under the chest for a fitted look. The minimal central ruffle didn’t work out the way that I envisioned but lucky the dress structure was pretty forgiving. The rainbow pom straps stitched over think black elastic are my favorite part – and I image that the matching pom pom necklace will add a fun touch to many different outfits. 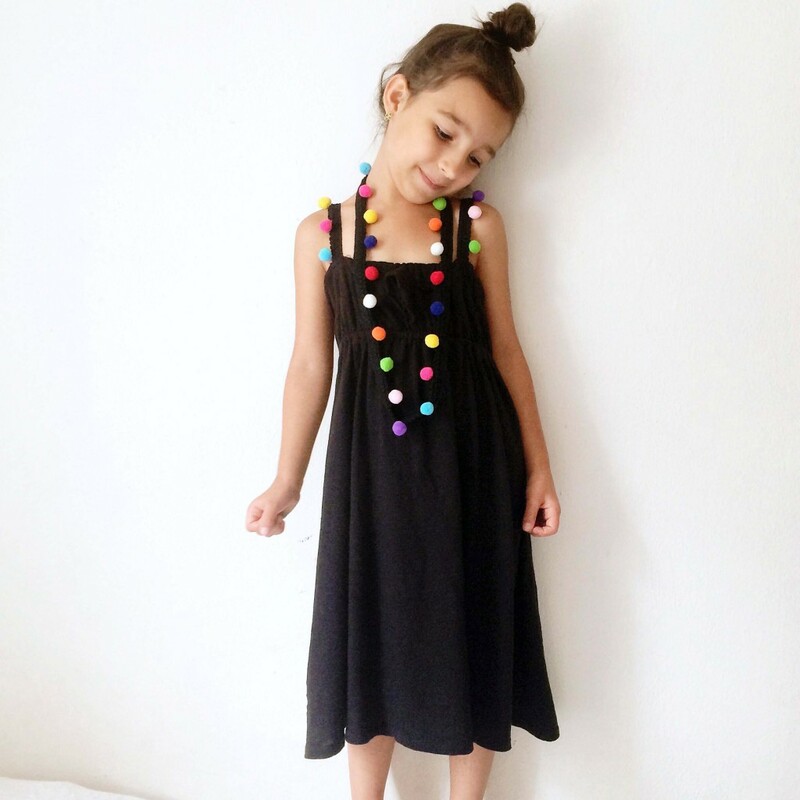 Thanks to Kids Clothes Week for the encouragement – I was excited to see one of my dresses featured on their summer inspiration post. It’s been a while since I’ve made something for the boy! The girl still loves the butterfly fairy costume that I made her, and I’m pretty sure that she’ll wear her Queen Elsa costume until it disintegrates. 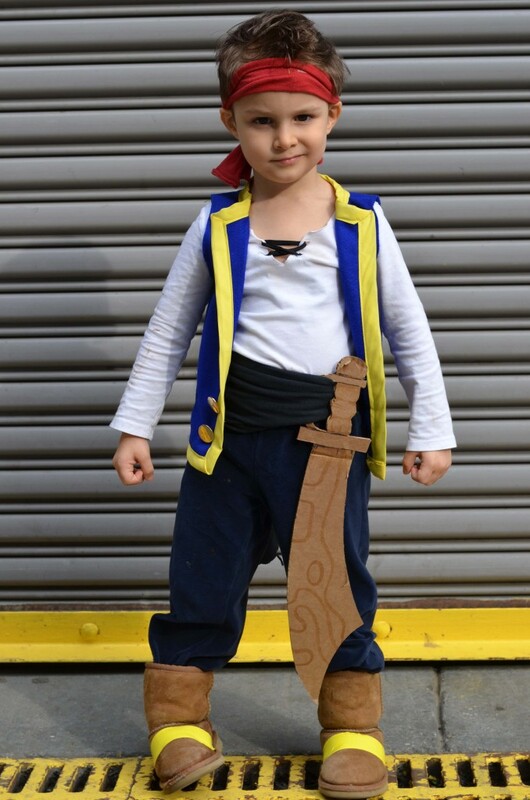 It’s clearly time to start building up my little man’s homemade dress-up options and our recent fun with Disney Live gave me the perfect opportunity to whip up a Jake Costume. I decided to include Adrian in the process and told him about our upcoming trip to the theater at Madison Square Garden. 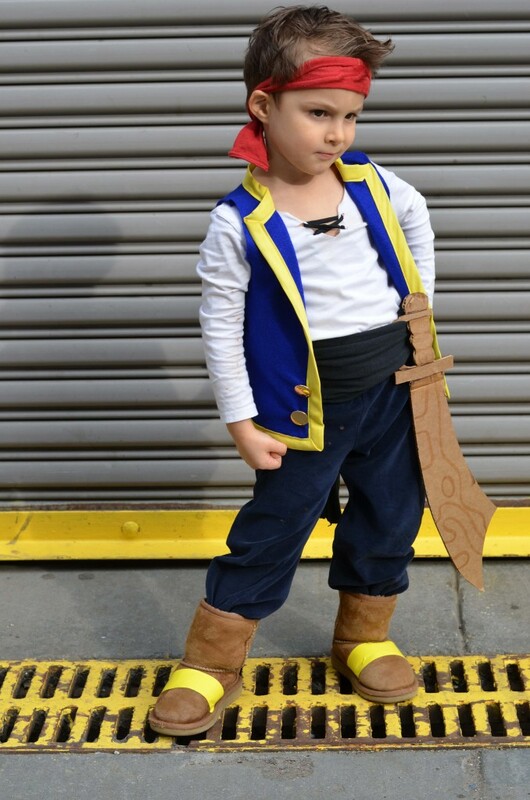 When I asked him if he would like a Jake costume he responded with a resounding “YES MAMA!!”. He was super excited and invested in every part of the process. The costume creation was a quick and simple project, and came together the afternoon before the show. I used this great Frontier Vest Tutorial to make the Jake vest and changed it up a bit. Instead of using felt strips as edging I purchased 2.75m Double Fold Quilt Binding (because I was too lazy to cut strips of felt!). It worked out well – just be mindful of your corners and curves. I didn’t fold over the front pattern piece, when cutting the felt, where indicated – and made it into a folded lapel as seen on Jake. The lapel was stitched in place to keep from folding forward and I added four shiny brass buttons (circles of felt or yellow buttons will also work). I cut the neck of one of Lucia’s old white shirts into a slight V and used one of her old tap shoe strings to lace it up. The headband and black cummerbund were made out of old clothing as well. 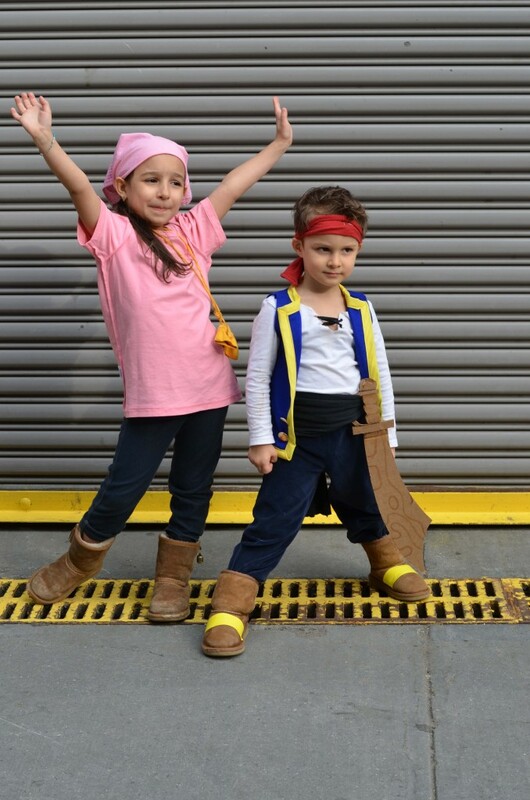 I bought yellow plastic tape at the hardware store and tapped a strip onto Adrian’s favorite Ugg boots. 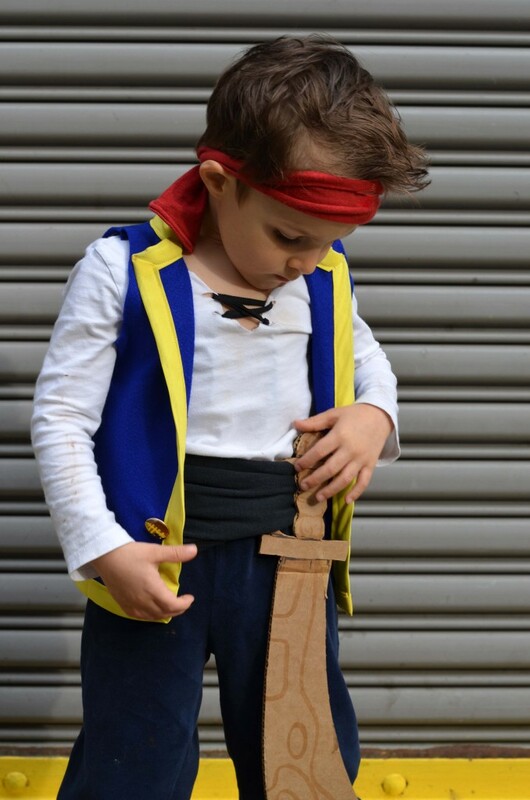 Daddy made him a cardboard sword and he was good to go! 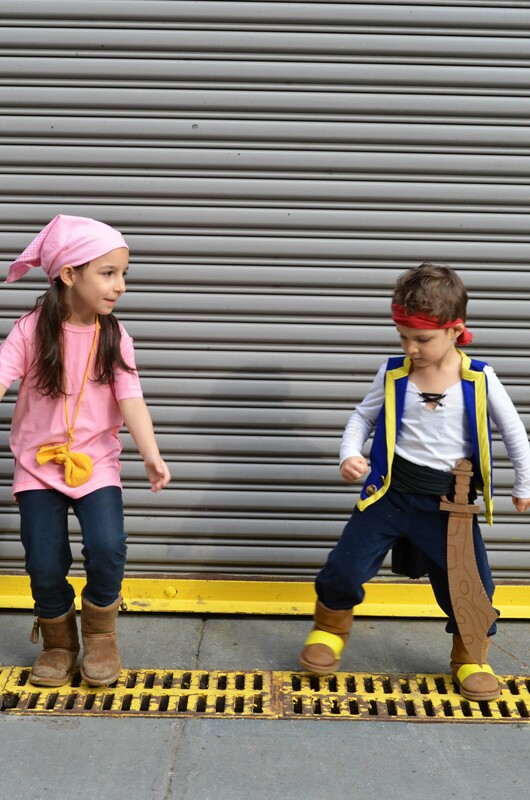 In other monumental news, the girl decided to dress up as a pirate (instead of a princess) for a Pirate and Princess themed show! Her love of princesses has always been intermixed with other good stuff but this mama inwardly cheered on her costume choice! We pulled the Izzy look together with an inside-out pink T-shirt, a cut up mitten on a string (sorry Adrian, it was about time you stopped wearing those “lobster” mittens) and a play tablecloth around her head. One of the things that I’ll certainly remember about Lucia’s fifth year of life is her love of drawing. Most days typically begin and end with art – and this past year was filled with mountains of unicorn and pony creations. Her creativity inspired me to whip up a homemade unicorn themed dress. I was on the hunt for the perfect fabric for quite some time and fell in love with this print by Pond Ripple on Spoonflower. The pattern is a hacked up version of Mary Abreu’s Classic Peasant Top pattern from her book Little Girls Big Style. I love the simple look of dress-tunics on Lucia and began sewing them for her a few years ago. I decided to add our signature Pom-Pom trim because Pom-Poms make everything a bit more fun! 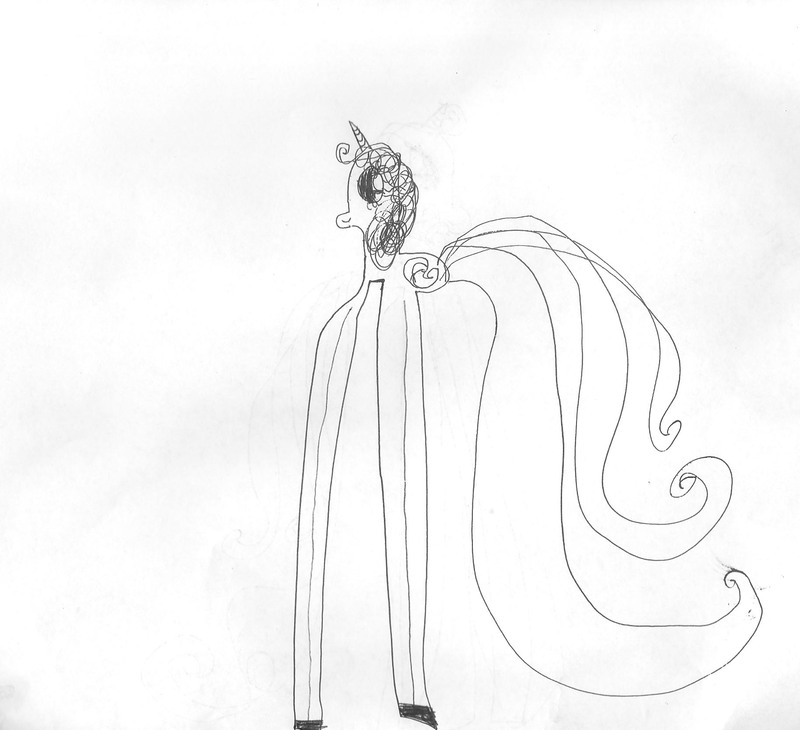 Although unicorns are now often replaced with girl-ninja sketches (how cool is that?!) – Lucia enjoyed wearing this little dress on our recent vacation to Florida. I think It’s perfect for spring and ponying around!